Today I have a card for Margaret. It's a long, overdue thank you card for being a marvelous friend and a wonderful hostess. It took me awhile to make my way back into my art room. I have now made several cards, so hopefully, with the physical therapy I am now receiving, I will feel like playing with paper more frequently! 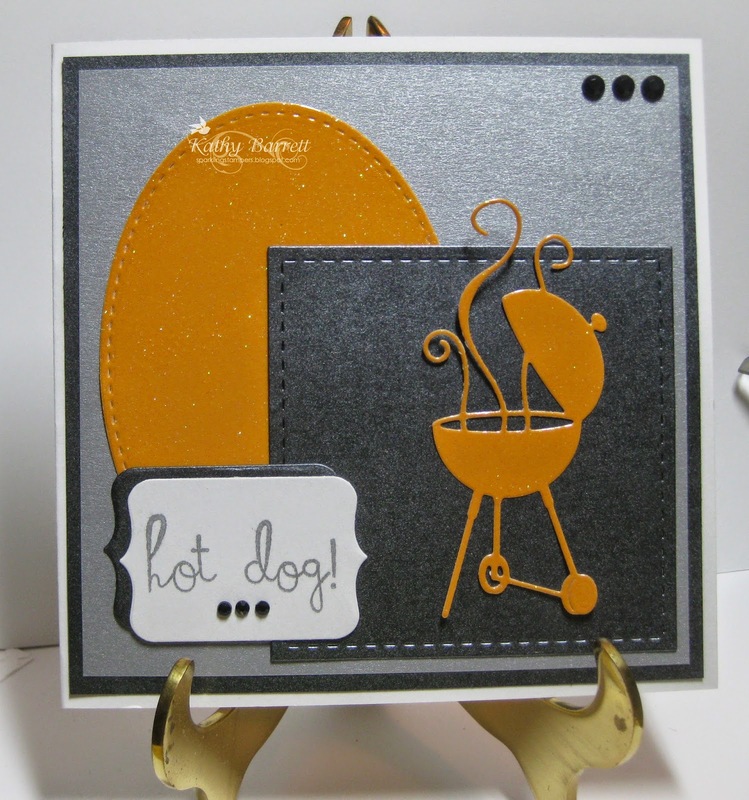 This card uses the Upsy Daisy stamp set from Stampin Up. 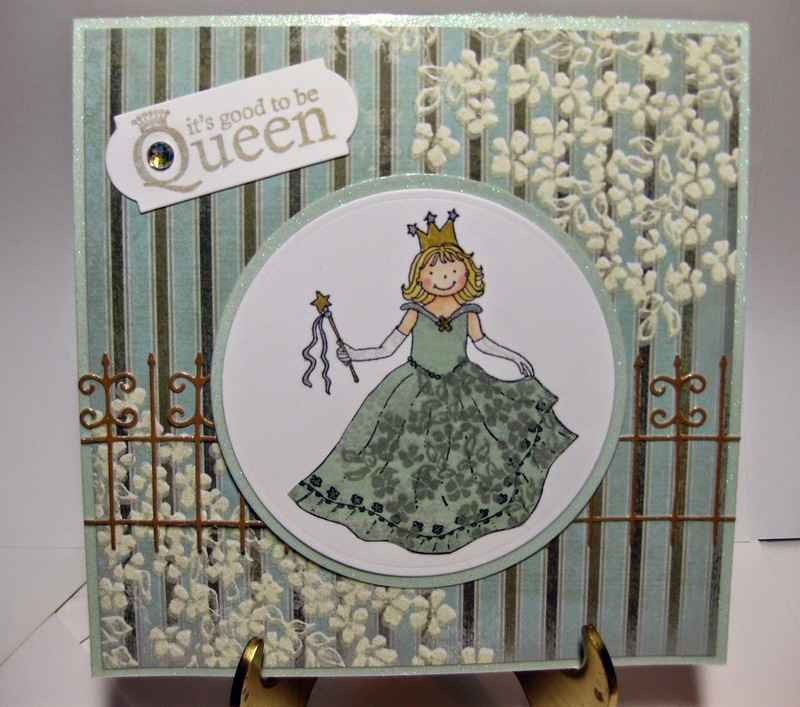 I used the same technique as my card a couple of days ago for my sister-in-law, using Tim HOltz distress inks. If you ever need a card quickly, this is the way to go. 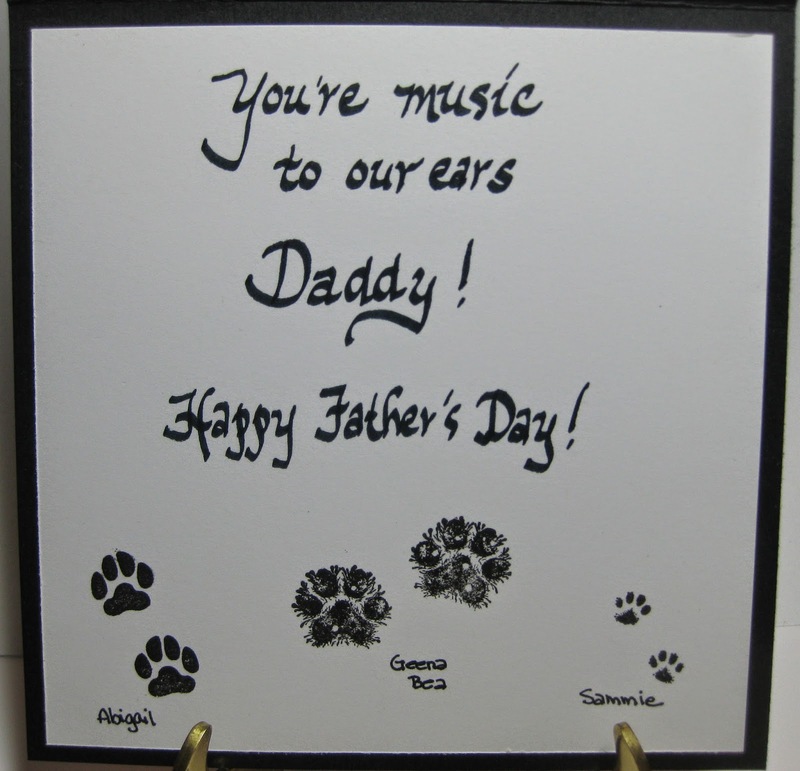 Ink the background, use silhouette stamps (no coloring), stamp a sentiment and mount. You're done! Hope Margaret gets to her physical mailbox before she gets to her virtual one! I'm back again a day after my last post! 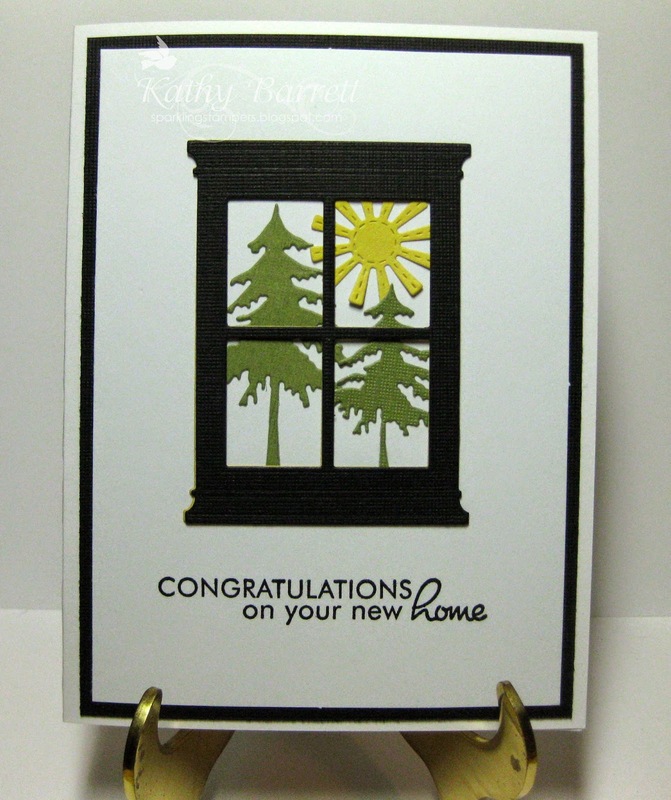 Today I have a card celebrating the purchase of a new home by my massage therapist. She is the sweetest person and has 2 lovely children (I've met her son and he is adorable). She's worked so hard to buy this house and I am so proud of her and for her. So I made this card and bought a bottle of sparkling grape juice and some glasses so that her little family can make a "toast" to their new life in their new home. The window die is from Memory Box. The sun is from Lil' Inkers. I think the trees are IO, but they could be MB, not quite sure. The sentiment is from PaperTrey Ink. I didn't take a picture of the inside, but I used a couch and a sentiment from PTI. It's really cute. I'll be back this week with yet another card - this one is FOR Margaret, so hopefully she will get it before the post! it has been far too long since I have posted here. So much has happened. I've even been to Colorado to visit Margaret. I've had some health issues that have kept me out of my art room for awhile. I hope to slowly get back into the swing of things. My mojo seems to be returning and my desire to create is definitely back. Now if I can keep health issues at bay, I just may get back to posting regularly! Tonight I have a card I created for my sister-in-law who is having a birthday this week. No worries, she doesn't follow my blog, so this won't spoil it for her. I used a technique I learned at a shop Margaret and I visited when I was in Colorado. 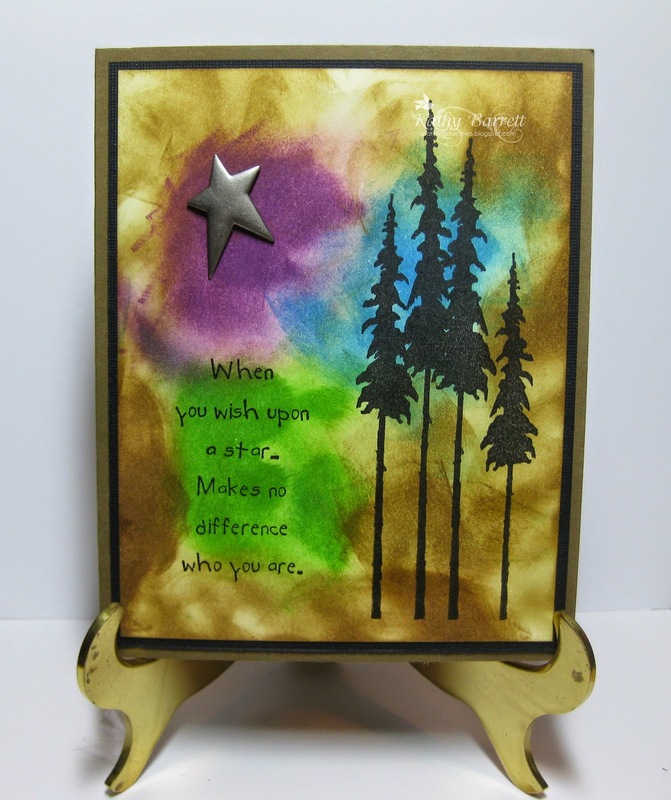 I used Tim Holtz distress inks for the background, spritzed with water and heat dried. Then I stamped the trees in Black Onyx. I got this stamp in CO, too. The sentiment is from Rubbernecker and I just love it. I added a pewter star from my stash on the purple haze and mounted it on layers. Easy peasy! I made 3 cards yesterday, so I will post again this week! Yea! As promised, I'm back again with another Father's Day card. Rainy Days and Mangled Shoes". It is produced by Dog Stamps Mas and I don't have a clue where I bought it, but I imagine it was from a trip where I visited local stamp stores. Of course, Geena Bea stamped her pawprint and told her daddy "happy father's day" and how happy she is to guard his grill...hot dog! I used Lil Inker stitched dies, MB grill and I'm not certain about the label die. I used sparkly DCWV paper. I used images from a variety of companies. The dp is from DCWV. 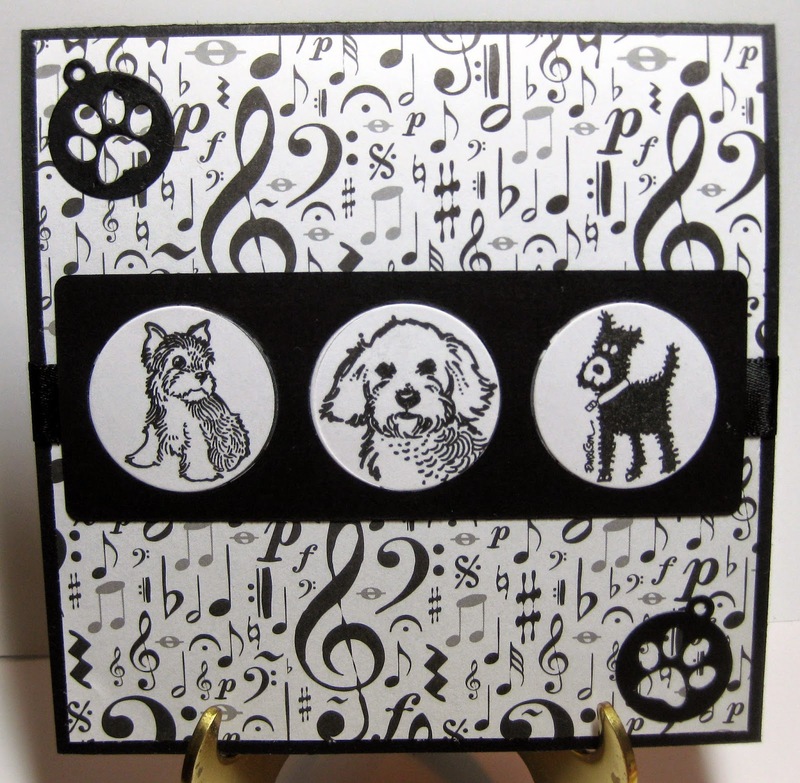 The peek-a-boo die and the pawprint die are both from MFT. There's a strip of black ribbon behind the peek-a-boo die cut. Thanks for stopping by! I'll be back with another card tomorrow.